Ascending Butterfly: Thursday, January 14, 2010 - Today's Words of Inspiration, a review and great giveaways! Thursday, January 14, 2010 - Today's Words of Inspiration, a review and great giveaways! Ƹ̵̡Ӝ̵̨̄Ʒ - We often Seek to find inspiration in Nature in the Spring or the Summer time, while entirely understandable, it doesn't always have to be this way. You can bring the outside in and surround yourself with constant sources of inspiration and wonder. Butterflies are one of my favorite forms of inspiration found in nature and I bring them indoors or carry them with me year round, in fabrics, jewelry, dinnerware, art, pottery and more. Another way many people bring their favorites 'right to their lap' is with coffee table books. And at first, I have to say I never understood them. A big book that takes up your entire coffee table, and most of the time everyone is afraid to touch it and mess up the cover so I thought to myself 'what's the point'? 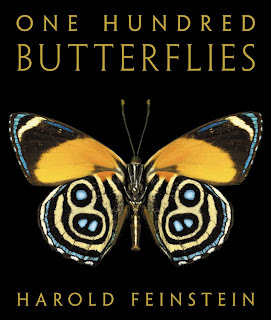 In anticipation of the 2010 return of our Monthly Book Club, I wanted to start with a review of an amazing book titled 'One Hundred Butterflies' By Harold Feinstein, Fred Gagnon. This is the definitive coffee table book for Butterfly lovers. For Spring Lovers. For Nature Lovers. For ME!!! In One Hundred Butterflies, photographer Harold Feinstein showcases butterfly varieties from around the world, turning exquisite details into mesmerizing works of art. Feinstein's breathtaking photographs capture the color, vibrancy, and infinite variety of patterns that occur on the wings of these ornate insects. One hundred impeccably reproduced, oversized photographs allow viewers to appreciate the Blue Morpho of Central America, the African Birdwing, and the Asian Swallowtail at a scale and depth impossible to experience in nature. Tracy, The book sounds lovely and that is just we all need in our lives is some loveliness and beauty. Unfortunately in today's society natural beauty is hard to find and then as a result people forget what real beauty is or they begin to take it for granted. I have read studies where people were exposed to nature for a week without any technology or city life at a retreat and they reported the most profound experiences and even said that their food and everything tasted different. Then upon coming back to society they were culture shocked. Ultimately what I am saying is that it is nice to have a book that can transport you to a place of love and beauty on a daily basis. Butterflies are so transforming just from their general metamorphic nature and we all need to see the butterfly in ourselves and utilize them to regenerate and change our lives.